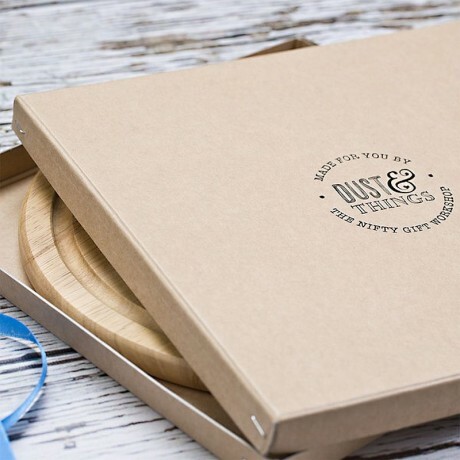 This gorgeous round wooden chopping board is engraved with the couple's name and wedding details, creating a lovely personalised wedding gift. 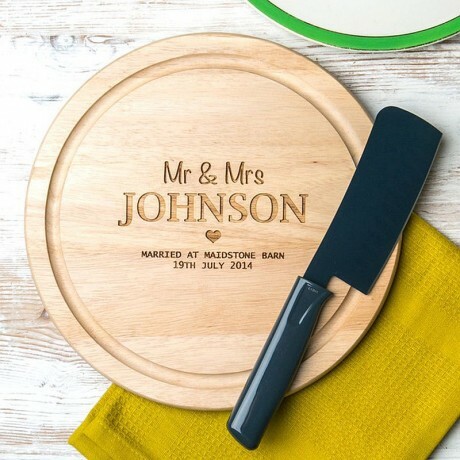 This personalised 'Mr & Mrs' chopping board holds so many happy memories of the big day, but can be used every day. Sweet! Give it as a gift to the happy couple on their wedding day, or for their first Christmas together. The 5th anniversary is traditionally wood, so this is a lovely choice for the fifth anniversary, too. This round chopping boards are a lovely shape and weight, perfect for the kitchen or to take to the table. The board is deeply engraved with 'Mr & Mrs' followed by the surname of your choice, and two lines for you to add the date and location of their wedding. A change to the titles can be made, so if you need 'Mr & Mr', 'Dr', 'Ms', or any other combination, simply let them know when placing your order. For an extra special gift, you can add a short message, engraved on the back of the board. Add their wedding date, a message to the happy couple, or your own choice of words. Please get in touch with the seller if you have any enquiries related to uppercase and lowercase letters within your engraving.